Five years ago, a visitor to what is now Duck Dance Farm, a four-acre property nestled in the South Toe area of Burnsville, could have gone fishing. But they might have reeled in an unexpected and inedible catch: a soggy canvas. “We pulled 20 paintings from a pond,” says Andrew Frank, remembering the shoddy condition of the land when he and his family arrived in 2010. Since then, Andrew, his wife, Pat Poole, and their son, Tommy Poole-Frank, along with his girlfriend, Christina Johnson, have been painstakingly restoring the place. They’ve transitioned the former fish camp into a diversified farm dedicated to conserving waterfowl and teaching sustainable living. Today, six of the farm’s seven ponds are teeming with noninvasive species of catfish, bluegill, redear sunfish, and largemouth bass, while one is a refuge for minnows that eat mosquito larvae and feed the larger fish. And the water that flows through the pond system from a nearby creek now returns to its source clean, with no trash or paint residues. The farm’s major focus can be found on the surface of the waters: scores of ducks and geese, nearly all of which are endangered breeds. The ducks lay an impressive amount of eggs (one breed, around 300 annually) and serve a dual purpose as meat birds. And the geese, while their egg numbers are lower, can lay for 50 years or more. The geese also serve as watchdogs, sounding an alarm to protect the farm’s ducks, chickens, and French guineas from predators. The birds at Duck Dance swim and free range at different times of the day, with the flocks kept separate for breeding purposes. They forage on the minnows, tadpoles, and worms that thrive in carefully constructed habitats, which also provide safe haven for newborn fish. The ponds don’t need restocking, as the species successfully reproduce in the redesigned ecosystem. Andrew notes, too, that Duck Dance’s animals are healthier from the outset. “We’re trying to advocate truly sustainable methods, and that means heritage animals that breed true from one generation to the next,” he says, something that can’t be done with the hybrid chickens found on most poultry farms. That’s a key message Duck Dance imparts in its educational programs, which include classes in duck-raising, sustainable aquaculture, homesteading, and humane poultry harvesting, as well as farm tours. If the family had to pick one word to define its farming philosophy, it would be responsible. “That covers the conservation aspect of what we do and that we’re trying to be good to the planet—to the water and to the land,” Tommy says. The family is hardly new converts to the sustainability movement. In fact, Duck Dance is their third farm using organic practices. While they are longtime farmers, the couple has also held jobs off the farm—Andrew in solar energy, Pat in arts education. They actually bought the Duck Dance property to retire on, but they’re living the adage that if you love what you do it doesn’t feel like work. “The joy of my life is to feed people,” Poole says. The family no longer sells meat—just eggs and animals—but they do utilize their fish, duck meat, and produce in meals prepared for guests staying in their Airbnb cabin and workshop attendees. What’s more, cooking classes are in store for the future. The family considers what they and their friends produce to be the highest quality food available—and the healthiest. But, they note, a little duck bacon never hurt anyone, including their vegetarian visitors, some of whom just can’t resist. 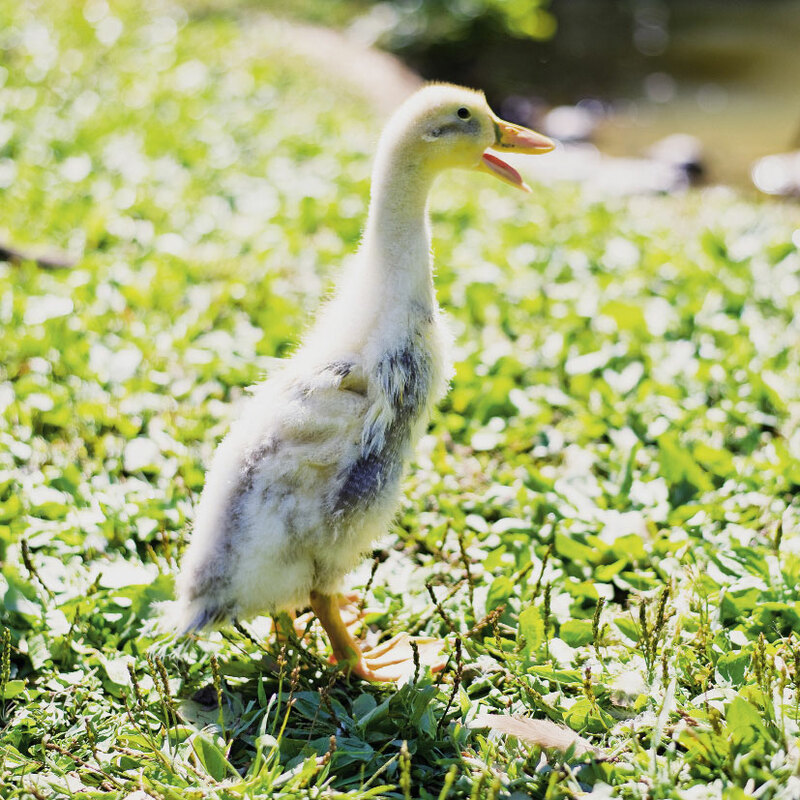 To learn more about Duck Dance Farm and its class offerings and educational tours, visit www.duckdancefarm.com or call (828) 675-2012.